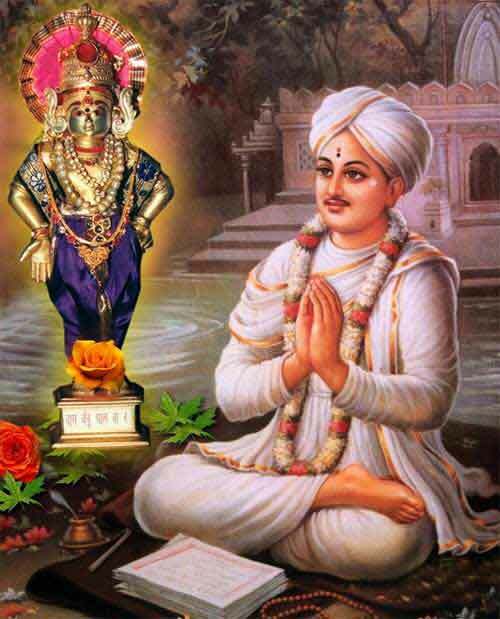 Eknath Maharaj, born in 1533 AD, at Pratisthan (Paithan), the capital of Chalukyas, on the banks of Godavari, was a famous saint poet of Maharashtra. His abhangs carry the universal teachings found in Hinduism. He was an ardent devotee from a very young age. Eknath was a poet who felt the pulse of the common man. He exhibits a keen observation of all that went on around him and paints them in vivid pictures. His works are enlivened by humor. Eknath defines Bhakti as the recognition of the divine nature of all beings. To utter the name of God is bhakti. It fulfills all desires of the mind. The name of God gives us divine happiness. His mystical experience is of the highest order. He gives notes of all the physical and psychical marks of the realization of God. Eknath Maharaj was the grandson of popular saint, Bhanudas, who brought back the murti of Vithoba from Vijayanagar to Pandharpur. Suryanarayana and Rukmini were Eknath’s parents but he lost them early in his life and he was brought up by his grandparents. Janardanswami was Eknath’s spiritual guru and teacher, and under him he studied Jnaneshwari and Amritanubhava. He married Girijabai but married life never stood in the way of his devotion. Girijabai was devout and completely supported Eknath in his life’s mission. Haripant and Godavari were his two children, and Mukteshwar, a great Marathi poet, was his grandson. Through his proper understanding of the scriptures, he was able to convince people and pursue them to take the path of Bhakti. He attained Samadhi at Paithan in 1599 AD. Eknath has rendered the eleventh skanda of Bhagavata into Marathi with all its wealth of thoughts. What is suggested by a word or two in the original Bhagavata, Eknath elaborates into whole chapters. Chthushloki Bhagavata – A commentary on the four verses on the 19th chapter of the second Skanda of the original Sanskrit Bhagavata. Eknathi Bhagavata – A commentary on the eleventh skanda of the Sankrit Bhagavata. It has 31 chapters and about 20,000 ovis. Jnaneshwari – This work completed in Bhadrapada month of Shaka 1506 (1584 AD) is of great importance in Marathi literature. Bharata Ramayana – Marathi version of Valmiki Ramayana. He wrote up to the 44th chapter. Chapters from 45 to 92 were completed by his friend Gavaba. Rukmini Swayamvara – Based on chapters 52, 53 and 54 of the tenth Skanda of the Bhagavata. In this metaphysical views, Eknath shows a distinct influence of Adi Shankaracharya. Eknath popularized Vedanta amongst the common people of Maharashtra. Jnanadeva’s influence on Sant Eknath is so great that his Bhagavat appears to be merely an enlarged edition of Jnaneshwari of Jnaneshwar. In all literary works of Eknath, Janeshwara’s thoughts, similes, and even phrases are found. Ranade. R. D 1961 Pathway to God in Marathi Literature. Mumbai. Government of Maharashtra. Encyclopedia of Hinduism Volume IV – India Heritage Research Foundation – Page no 19 – 21.